Join the thrilling infantry battles of the Star Wars™ galaxy with Star Wars: Legion, a two-player miniatures game that puts you in command on a war-torn battlefield of the Galactic Civil War. While innovative mechanics simulate the chaos of battle and the fog of war, thirty-three unpainted and easily assembled miniatures give you a blank slate to paint and create a truly unique army. Over the course of six rounds, you must battle and maneuver your units to claim objectives. The points you gain from these objectives are your pathway to victory, and whoever has the most points at the end of the game claims victory! 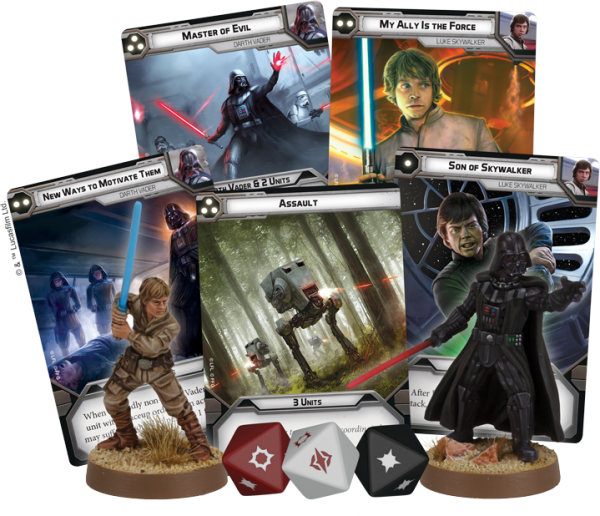 Whether you’re brand-new to miniatures games or a seasoned veteran, Star Wars: Legion is the perfect entry point to the hobby. 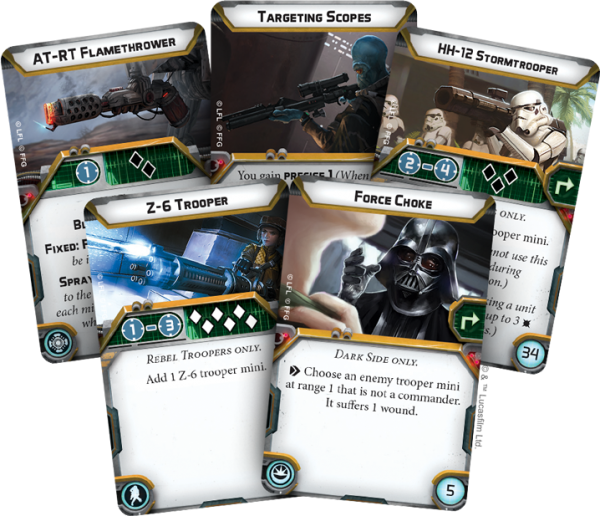 At the beginning of each round of Star Wars: Legion, you and your opponent select a command card from your individual hands of command cards. The card that you select determines which player acts first throughout the round, and it also lets you deliver orders to a few of your units. Ordering a unit in the command phase simply places an order token next to that unit. Then, during the activation phase, you have a choice—activate a unit that you ordered during the command phase, or draw a random order token from your order pool, which forces you to activate a unit of the same rank. Whether you want to guarantee you strike first or hold one unit’s attack until the last possible second, your command card gives you the means to deliver orders to your most important units. To complete your objectives, you’ll need to lead your units into battle, maneuvering them into the perfect position and launching a crushing attack. In Star Wars: Legion, movement is fast and organic. Every unit has a speed, which dictates the movement tool that unit can use. To move a unit, you’ll line the movement tool up with the base of the unit leader and move him to any point along the tool. Then, you can pick up every miniature in the unit and place them within a short move of the unit leader, keeping movement fast-paced and interesting. Combat in the game is equally streamlined. Every unit has one or more weapons listed along the bottom edge of its unit card. During an attack, you’ll select a weapon for each attacking miniature and add those dice to your attack pool. After you roll your attack dice, your opponent rolls a defense die for each hit that you’ve rolled and any damage that persists takes down enemy soldiers! Even if you’re attacking with a large squad, every combat roll in Star Wars: Legion keeps the game moving quickly.